17/09/07— Acquisition — Paris, Musée du Louvre — A student of Michel-Ange Slodtz, Prix de Rome in 1751 and member of the Académie de Saint-Luc, the sculptor André Brenet is less famous than his brother, the painter Nicolas-Guy. His date of death is not known, and his work still largely unrecognized. Some exceptions are an excellent terra cotta group representing the Baptism of Christ in the church of Saint-Jean de Choisel near Rambouillet and four overdoors in marble for the manor house in Clapiers-Cabris in Grasse, owned by the Gulbenkian Foundation in Lisbonne and the Musée de Grasse . It is possible that the relief acquired by the Louvre (ill.), signed and dated 1744, was also sculpted for this décor. 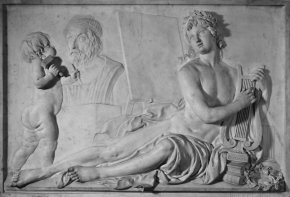 The work represents Apollo surrounded by the attributes of the Arts (Music, Poetry, Sculpture, Painting and Architecture) in a neo-Classical style which is quite different from the , almost Baroque executed six years earlier, in 1768, in a spirit close to that of his master Slodtz. Working from only these few pieces, it is difficult to grasp the style of an artist who deserves to be rediscovered. Thanks to the Amis du Louvre who purchased it on the American market, this new addition to the Departement des Sculptures should help in doing so. See the text by Guilhem Scherf in the Bulletin trimestriel de la Société des Amis du Louvre of June 2007.